– We’ve built on the default encryption, enhanced SELinux security enforcement and multi-user support in Android 5.0, Lollipop to create a dedicated work profile that isolates and protects work data. IT can deploy approved work apps right alongside their users personal apps knowing their sensitive data remains secured. People can use their personal apps knowing their employer only manages work data and won’t erase or view their personal content. Android for Work app – For devices running Ice Cream Sandwich through Kitkat, or that don’t run work profiles natively, we’ve created the Android for Work app. The app, which delivers secure mail, calendar, contacts, documents, browsing and access to approved work apps, can be completely managed by IT. Google Play for Work – It allows businesses to securely deploy and manage apps across all users running Android for Work, simplifying the process of distributing apps to employees and ensures that IT approves every deployed app. Built-in productivity tools – For everyday business tasks, we’ve created a suite of business apps for email, contacts and calendar, which supports both Exchange and Notes and provides document editing capabilities for documents, spreadsheets and presentations. Consistent management – Enterprise mobility management (EMM) providers integrate with standardized management APIs to create a simple way to manage all Android devices, new and old, from one dashboard. 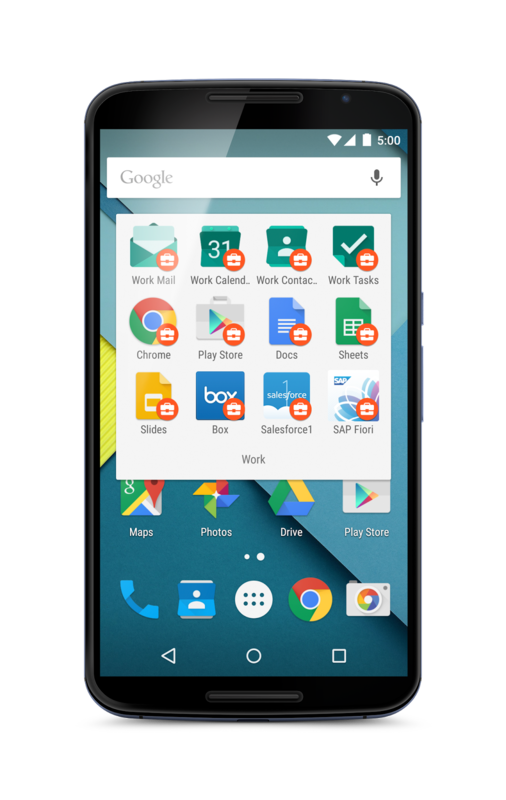 All Android for Work capabilities are delivered through EMM partners, with more providers available soon. Secure business apps – Software vendors and developers can create a single version of any Google Play app that can be securely deployed to any Android device without alterations or wrapping. And they can create standard management configurations that allow IT to apply policies per app. Innovative devices – Android smartphone and tablet makers are a key part of the Android for Work program, as they create devices and experiences that add additional value for customers. Together with a wide range of management, application and device makers, we believe the Android for Work program provides businesses and workers with the choice and flexibility they need to get things done at work. Learn more by visiting google.com/work/android. Over a billion people today carry Android smartphones—devices that are more powerful than the computers we used just a few years ago. For many, these phones have become essential tools to help us complete important work tasks like checking email, editing documents, reviewing sales pipelines and approving deals. But for the majority of workers, smartphones and tablets are underutilized in the workplace. Their business and innovation potential remain largely untapped. Today we're announcing the Android for Work program to tap into that potential. With a group of partners, we're helping businesses bring more devices to work by securing, managing and innovating on the Android platform. Work profiles – We’ve built on the default encryption, enhanced SELinux security enforcement and multi-user support in Android 5.0, Lollipop to create a dedicated work profile that isolates and protects work data. IT can deploy approved work apps right alongside their users personal apps knowing their sensitive data remains secured. People can use their personal apps knowing their employer only manages work data and won’t erase or view their personal content. 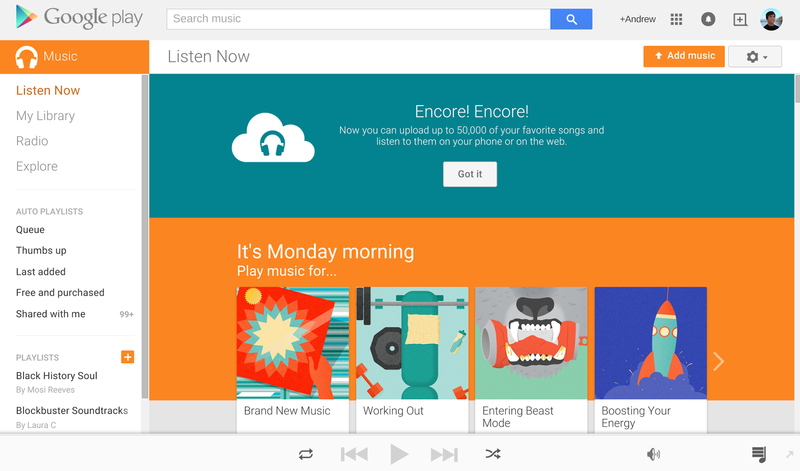 Sign in to Google Play Music - Go to your computer and visit play.google.com/music. Sign in with your Google account if needed. Claim your free storage - If you’d like to try our subscription service too, click “Get Started.” Otherwise, click “No Thanks” to continue with the free storage. Add your music collection - The setup process will guide you through adding our Chrome app, which provides seamless uploading. You can choose to simply upload your entire iTunes library or select other music folders. Access your music everywhere - You can stream or download music to your Android, iPhone or iPad for easy offline listening. It’s also all available on the web when you’re on your computer. And best of all, when you upgrade to a new computer or phone, your music comes along, too. Not using Chrome? At step 3 the setup process will instead guide you through installing Music Manager. Don’t worry, you can still add 50,000 songs. Wondering what to do after you’ve stored all of your music safely online? Test drive our music subscription service to listen to any song on demand and find expert curated radio stations for any mood, activity or time of day. Encore! You’ve joined the streaming revolution, but still have that MP3 player you take to the gym. It has your pump-up playlist, all of the Phish live concerts, and the brand new recordings from your friend’s band. Keep things simple by using Google Play Music, which gives you subscription access to 30 million songs on any device and also offers you a place to store the music collection you already own, for free. Today we are expanding the music storage limit on Google Play. Now you can store 50,000 songs for free and stream or download them them to your phone, tablet, computer or Chromecast.